Today’s card is for the December 2016 Facebook Progressive Challenge in Digistamps4Joy stamping Facebook Group. One of the images for December is a Wreath. In addition to Wreath from Digistamps4Joy, I used Prismacolor Premier colored pencils in the following colors: Grass Green (PC 909), Dark Green (PC 908), Yellow Ochre (PC 942), Lemon Yellow (PC 915), Sunburst Yellow (PC 917), Carmine Red (PC 926), Crimson Red (PC 924), 50% French Grey (PC 1072) and a craft knife with glass cutting mat to fussy cut out the wreath. The cardstock is from my stash, the holly leaves were leftover from another project (cut from Cricut Close To My Heart Art Philosophy cartridge – Tag – #M44E8F – retired) and Ranger Tim Holtz’s Distress Stickles in Fired Brick. I used Thin 3-D Foam Tape (Z2060) to attach the wreath to the card front. If Facebook Progressive Challenges are new to you, you have until the end of the month to purchase the current image for $1 and post your creation in the Digistamps4Joy Stamping Facebook Group. One of the image for December 2016 is Wreath. I enjoy seeing how each of use the same image in different ways. I am not an affiliate for shopping sites, but I am a Close To My Heart Independent Consultant. References to and links to companies/brands are for your convenience only. Today’s card is for the November 2016 Facebook Progressive Challenge in Digistamps4Joy stamping Facebook Group. The image for November is Quiet Time. 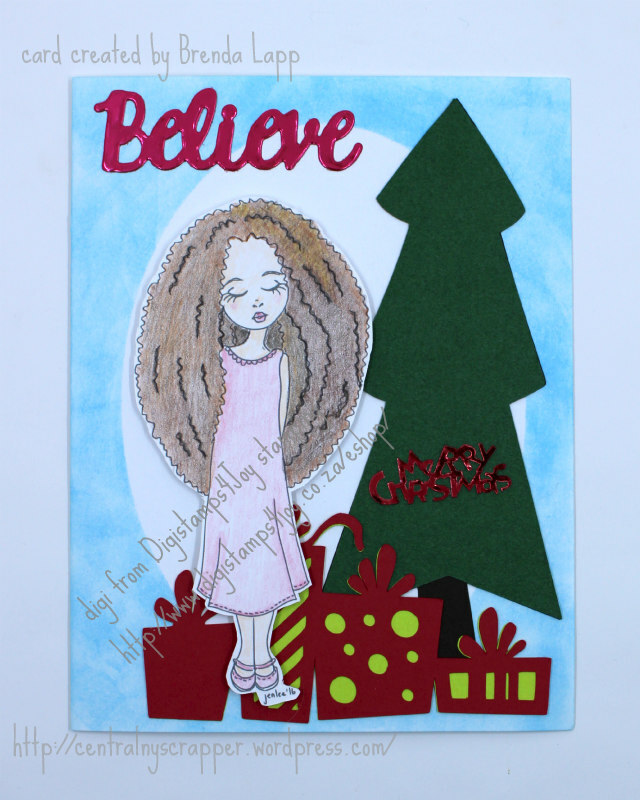 In addition to Quiet Time from Digistamps4Joy, I used the following products to create my card: cardstock from my stash, Crayola Colored Pencils (50 color pack), Cricut® cuts Gift Border – #M3BDDA from Classroom – December & January and tree – #M30505 from Doodlecharms®, Believe was die cut from Crafter’s Companion Diamond Press Holiday Bundle and Merry Christmas is a piece of confetti. I cut an oval on my Cricut® to create a mask and used a makeup sponge to apply Close To My Heart Sky Ink (retired) on the card front. If Facebook Progressive Challenges are new to you, you have until the end of the month to purchase the current image for $1 and post your creation in the Digistamps4Joy Stamping Facebook Group. The image for November 2016 is Quiet Time. I really enjoy seeing the different ways the images are used. Today’s card is for the October 2016 Facebook Progressive Challenge in Digistamps4Joy stamping Facebook Group. The image for October is Fuschia. In addition to Fuschia from Digistamps4Joy, I used the following products to create my card: Lyra Rembrandt Polycolor Pencils, Tattered Lace Sentiments 2014 Die, Spellbinders Celebra’tions Pierced Rectangles and card stock from my stash. I am not an affiliate for shopping sites, but I am a Close To My Heart Independent Consultant. The links above to other companies/brands are for your convenience only. I wanted to create a clean and simple card to highlight the image. If you have a moment, please leave a comment and let me know what you think. Thank you for stopping by today. Today’s card is for World Cardmaking Day. This image was provided by the Digistamps4Joy stamping Facebook Group to Rock World Cardmaking Day (it is still October 1 somewhere…). The image is Daisy Corsage. 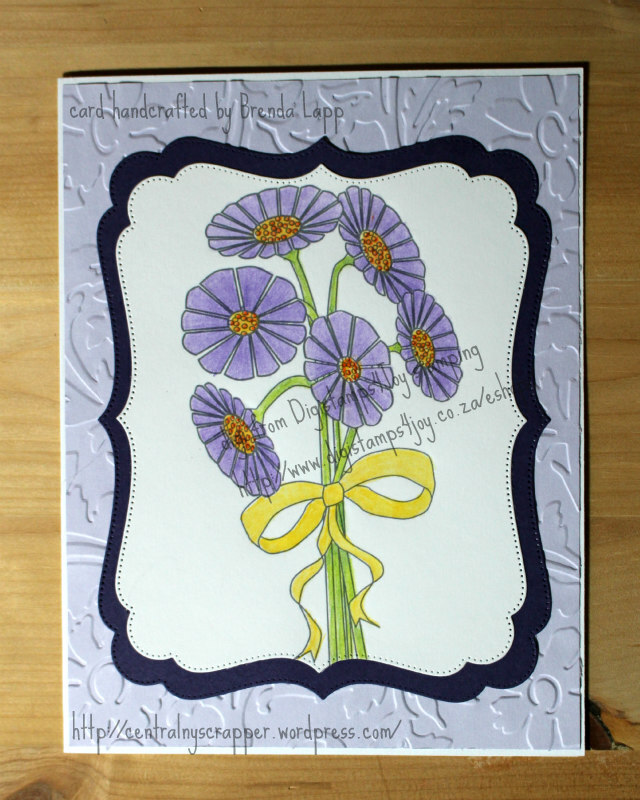 In addition to Daisy Corsage from Digistamps4Joy, I used the following products to create my card: Lyra Rembrandt Polycolor Pencils, CTMH Floral Embossing Folder (Z1994) – retired, Tattered Lace Pin Dot Decorative Rectangles, card stock and a card base from my stash. I used these pencil colors: 08 – Canary Yellow, 15 – Dark Orange, 36 – Dark Violet, 38 – Violet, 68 – Moss Green, 70 – Apple Green and 85 – Light Ochre. 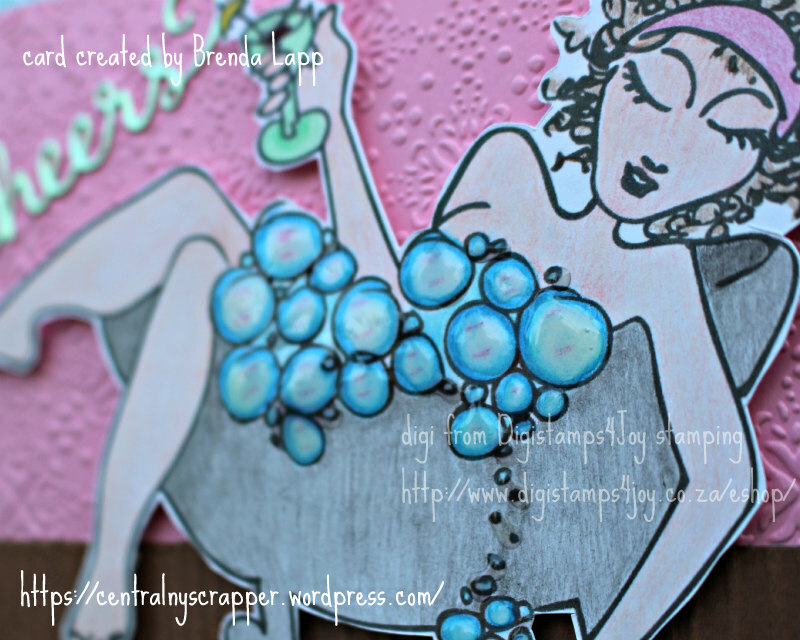 I hope you found a chance to be creative this cardmaking day. Since not everyone would agree with the message on the shirt, I used some Paper Notes in Ribbet to edit out part of the photograph as I did not not want anyone to be offended. Normally, this is not a project I would do and is likely not a shirt I would wear myself, but when life throws you a curve ball you do not always do what you would normally do. I first saw a design similar to this on a Facebook group. I modified it a bit. I selected my own fonts, made the ribbon larger and placed it on an angle so it looks more like a ribbon and less like someone hand wrote ck – attaching the letters as they wrote – and completoing a word that offends some. 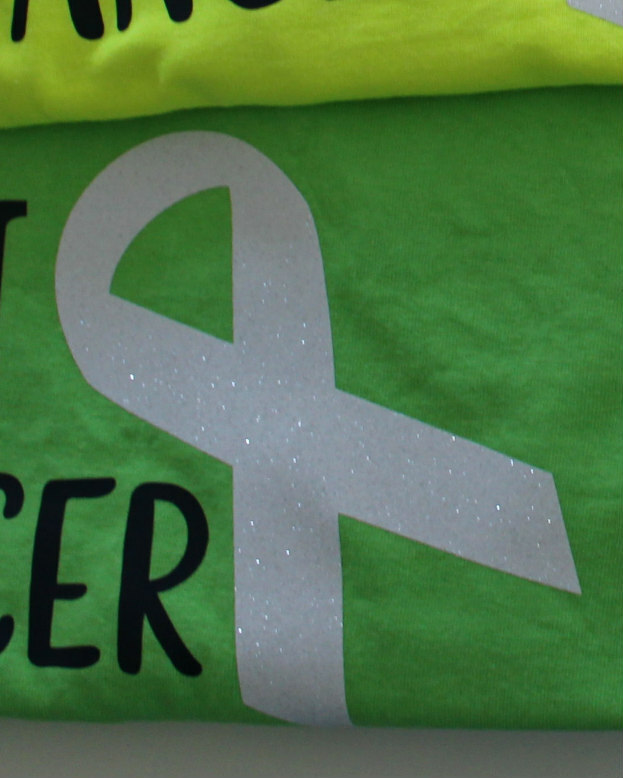 Here is a closeup photo of the ribbon. I used glitter heat transfer vinyl on it and wanted you to be able to see how it looks. I am so pleased with the results. I selected white glitter HTV since I read that pearl, clear and white are ribbon colors that are often used for lung-related illnesses. 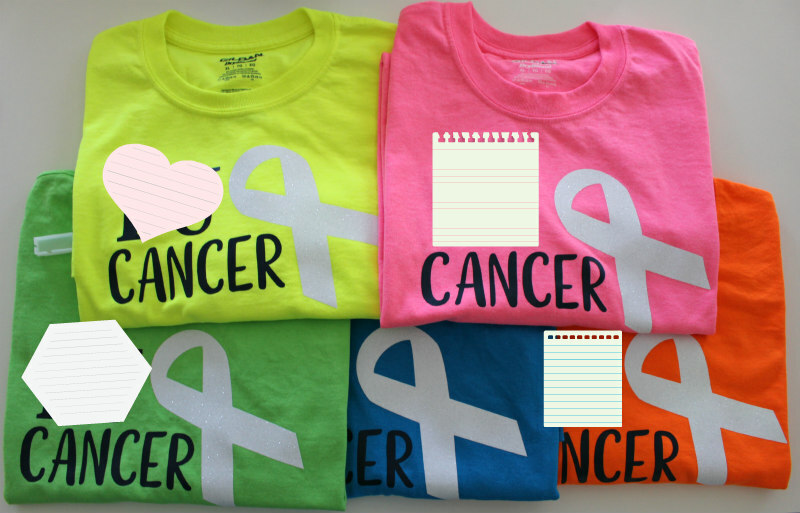 Supplies I used to create the shirts: t-shirts, Cricut® Iron-On Lite – Navy and Cricut® Iron-On Glitter – White Glitter. The fonts are Cricut® Alphabet – Regular and Market Street Fonts – Eloise – Regular. The ribbon is from Stand and Salute. I am in a few Cricut® groups on Facebook and there are a lot of folks, men and women, making their own t-shirts using heat transfer vinyl. Some people have even invested in a heat press to make shirts. Making shirts is something I may do occasionally, but not something I see myself doing a lot of, so I have not and probably will not purchase a heat press. Since I do not have a heat press, I used the following method to attach the HTV to the shirts. I pre-washed the shirts with a detergent that does not have softener and did not use fabric softener in the rinse cycle or in the dryer. I placed a wooden cutting board under the top layer of the shirt and used parchment paper in lieu of a pressing cloth (I originally started with a pressing cloth, but it seemed like enough heat was not getting through to attach the HTV). I had to press longer than the instructions stated, but I took care to watch to scorching. I included a note with the Cricut® suggested care instructions of washing and drying the shirts inside out. I received a note from my aunt and they like the shirts. I am happy they do. Today’s card is for the September 2016 Facebook Progressive Challenge in Digistamps4Joy stamping Facebook Group. The image for September is Hic … oops. In addition to Hic … oops from Digistamps4Joy, I used the following products to create my card: Lyra Rembrandt Polycolor Pencils, Liquid Glass (Z679), Wood Slats Embossing Folder (Z3248), Tattered Lace Victorian Dots and Stripes Embossing Folder Set (I acquired mine in the Tattered Lace Victorian Embossing Folders Collection), Diamond Press Sentiments, the cut Card – #M40866 from the Cricut®/Close To My Heart – Art Philosophy cartridge (retired) and mirri card, card stock and a card base from my stash. Here is a closeup of my bubbles. The coloring of my bubbles I was inspired by an image I viewed online. After coloring with three colors, I added Liquid Glass to add shine and dimension. I also put Liquid Glass on the beverage in the glass and spilled on the floor. I used these pencil colors: 27 – Light Carmine, 28 – Rose Madder Lake, 30 – Dark Flesh, 31 – Medium Flesh, 32 – Light Flesh, 51 – Prussian Blue, 54 – Aquamarine, 95 – Cool Dark Grey, 97 – Medium Grey and 98 – Cool Dark Grey. I also used two greens to color the bottle and glass, but unfortunately the pencils slipped back into the case before I could note the colors used. If Facebook Progressive Challenges are new to you, you have until the end of the month to purchase Hic … oops for $1 and post your creation in the Digistamps4Joy Stamping Facebook Group. I have to say I always see images used in ways I did not anticipate. I really enjoy seeing the different ways the images are used. I am not an affiliate for shopping sites, but I am a Close To My Heart Independent Consultant. The links above to other companies/brands are for your convenience only. I have been able to keep up with the Progressive Challenge and receive the next month’s digi for free when I post a project created with the current month’s digi in the Facebook Group. 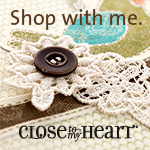 If you are located in the United States, Puerto Rico, Guam or on U.S. military bases and are interested in purchasing Close To My Heart products you may go to my CTMH Online Business Address where, if you make a purchase, I will receive a commission. I hope you find my card imaginative. If you have a moment, please leave a comment and let me know what you think. Thank you for stopping by today. I created this card for an aunt who recently received a cancer diagnosis. I wanted her to know that we are thinking of her. 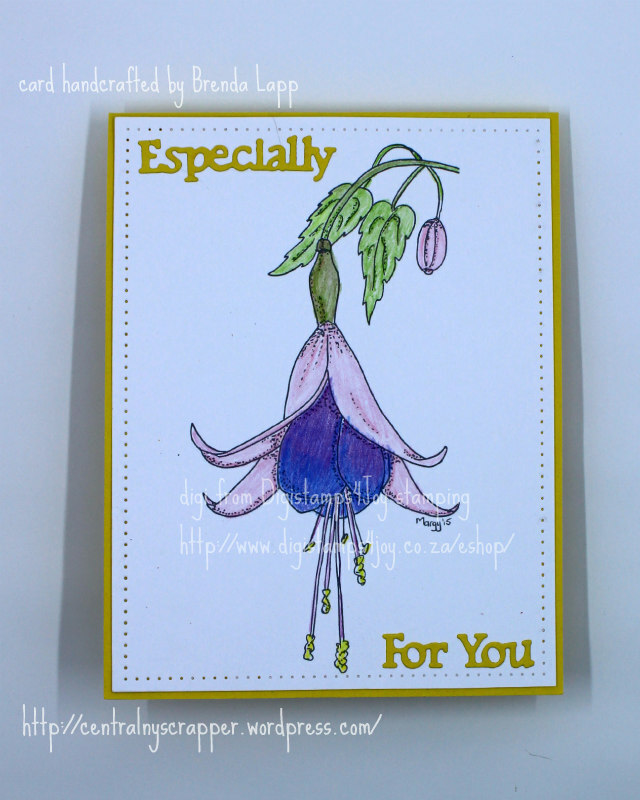 I learned about this type of card from Karen Hanson’s blog SCRaPPY CaNuCK STuDioS. This is a standard A2-sized card, but I think it packs a cute little surprise. It opens as a tent fold card, but there is a spot for a surprise sentiment or stamped image. And there is still room for a sentiment and a place to jot a note and/or sign the card inside. Supplies I used to create this card: cardstock from my stash, My Acrylix™ Create Kindness—Beautiful stamp (CC1147), My Acrylix™ Create Kindness—Hello stamp (CC1150), My Acrylix™ September 2016 SOTM: Blessed Beyond Measure Stamp Set (S1609) — the Create Kindness and Stamp Of The Month stamps are only available until September 30, 2016, My Acrylix™ So Many Smiles stamp set (C1619), My Acrylix™ So Many Smiles stamp set (C1619), My Acrylix™ Pen Pal stamp set (B1539) and Black Memento™ Ink Pad (Z899). 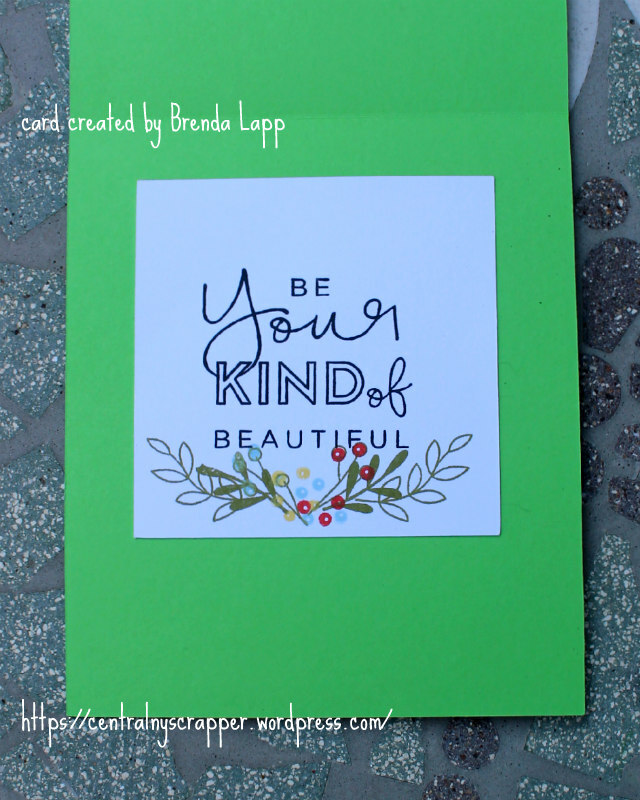 I also used the “Insert Shapes” feature in Cricut® Design Space to create a basic card with squares for stamping and layering to cut with my Cricut® Explore. If you use CDS, you will find my file here. I am a Close To My Heart Independent Consultant. Most of the links above are to CTMH products. If you are located in the United States, Puerto Rico, Guam or on U.S. military bases and are interested in purchasing Close To My Heart products you may go to my CTMH Online Business Address where, if you make a purchase, I will receive a commission. I hope my aunt loves the card and her spirits are boosted when she receives it. 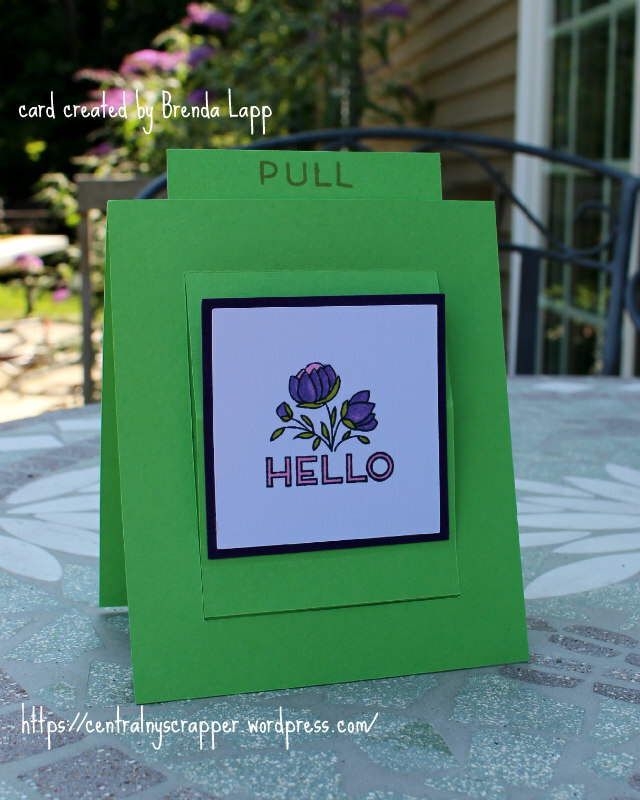 I hope you also like my card and are inspired to create a Surprise Pop-Up Card. If you are inspired and have moment, please leave a comment. Thank you for visiting today. My name is Brenda and I live in the Finger Lakes area of New York State not far from the Cayuga Lake Wine Trail. I have been crafting my entire life. In addition to working at a local University, I am a Close To My Heart Independent Consultant. 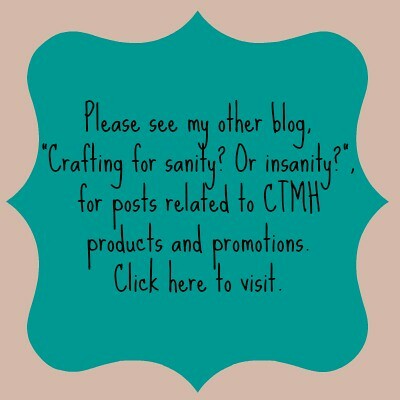 I also have a blog at http://centralnyscrapper.blogspot.com/ for posts related to CTMH products and promotions. If you are looking for a CTMH Consultant I would be delighted if you contact me. The button above will take you to my Online Business Address.